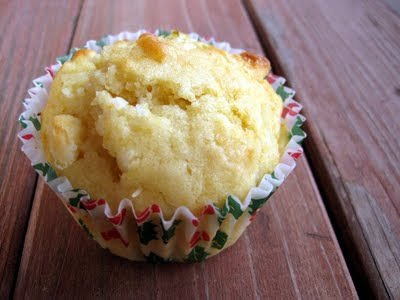 Here are a few of my favorite recipes from this year of cooking and baking on Cupcake Muffin. I hope you enjoy them as much as I did, and I look forward to lots of delicious treats in the future! 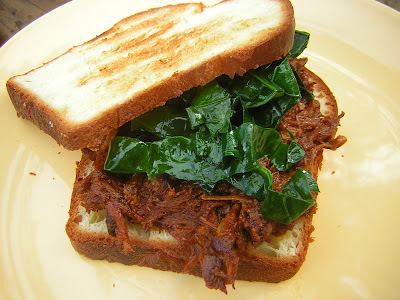 I'm sending this pulled pork recipe off to Homemade - End of 2009 Edition. 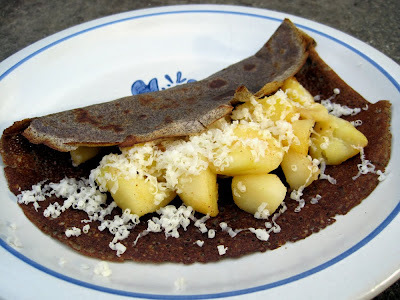 My friend Peter and I made these buckwheat crepes a few weeks ago and loved them! I've doubled the amounts in the recipe printed below because the fillings we made were not quite enough for three but there were plenty of crepes. The amounts below should feed four, although extra fillings are always welcome so feel free to make a bit more if you're feeling extra hungry. The crepes themselves are from the Food Network Magazine, and they were the perfect way to use up some of the buckwheat flour that's been in my pantry ever since I made these butter cookies from Alice Medrich. Luckily it was still good, and it made for thin but hearty pancakes that stood up well to dinner fillings. We mostly improvised the fillings, combining spinach, caramelized onions, sweet Italian sausage, and feta cheese for a semi-Greek crepe. Any green would be tasty here - chard, mustard greens, etc., as would subbing out the cheese for another creamy cheese like goat cheese. 1. Place all the crepe ingredients in a blender and blend until smooth. Scrape into a bowl and let rest at room temperature for at least 1 hour. 2. Make the fillings: Heat the oil over medium-high heat in a skillet. Add the spinach and cook until just wilted, about 4 minutes. Season with salt and pepper. 3. Heat the butter in another skillet over medium-low heat. Add the onions and thyme and season with salt and pepper. Cook until the onions are soft and lightly browned, about 20 minutes. 4. Cut the sausages into small pieces and brown in a skillet until cooked through. 5. Make the crepes: Preheat the oven to 300 degrees. Heat an 8-inch skillet over medium heat until a drop of water sizzles in it. Lightly butter the skillet and then pour in a scant 1/3 cup of batter and quickly swirl to coat the bottom of the pan. Cook until the crepe sets and browns around the edges, about 2 minutes. Carefully flip the crepe and cook the other side about 30 seconds. 6. Repeat with remaining batter, adding more butter as needed. Stack the finish crepes, wrap in a damp dishtowel, and place in the oven to reheat, about 10 minutes. 7. 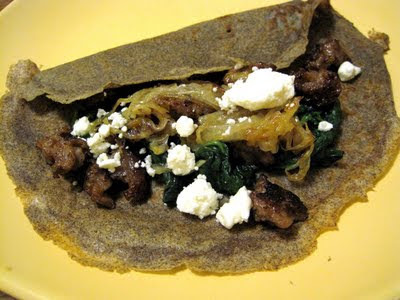 Assemble the crepes: Fill each crepe with spinach, onions, sausage, and crumbled feta cheese. Any leftover pancakes can be filled with sweet fillings for breakfast the next day. This one is filled with an apple (peeled, chopped, and sauteed in butter until soft) and topped with grated sharp Cheddar. 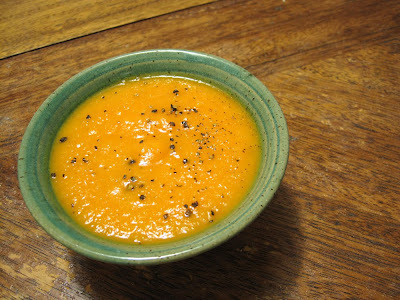 This carrot-ginger soup is healthy but still absolutely delicious, and it's the perfect thing to eat when you're hit with a cold. I made this a few weeks ago when I was hit by just such a cold, but it would also be an excellent post-holiday soup after all the rich things we've been eating. Be sure to serve with a swirl of sour cream, yogurt, or creme fraiche to add a bit of richness and cut the spicy ginger flavor of the soup. 1. Heat oil in a large saucepan over medium heat. Add the onion and ginger and cook, stirring occasionally, until soft and fragrant, about 5 minutes. 2. Add the carrots, stock, and orange juice. Season with salt and pepper. Increase heat to medium high and bring to a boil. Reduce heat to low, cover the pan, and let simmer until the carrots are very tender, about 45 minutes. 3. 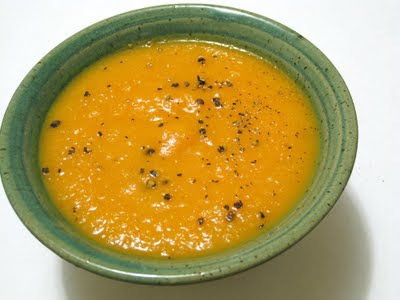 Puree the soup in a blender or food processor, or with an immersion blender. For a smoother texture, strain through a sieve. 4. Add the nutmeg and season to taste with salt and pepper. If the soup is too thick, thin it with water or more stock. 5. If needed, rewarm the soup over medium-low heat until hot. Garnish with crème fraiche or sour cream and freshly ground black pepper. Gourmet, unbound is a great new blog project that seeks to celebrate recipes from past issues of Gourmet magazine now that new issues won't be coming out. When I saw the site, I knew I wanted to participate! Each month bloggers choose a recipe from that month, but any year (so for January's roundup, we all chose recipes from a past January issue of Gourmet). I found an amazing-sounding Orange Cake, and substituted tangerine zest and juice since that what looked good at the grocery. The cake turned out moist, flavorful, and not-too-sweet. 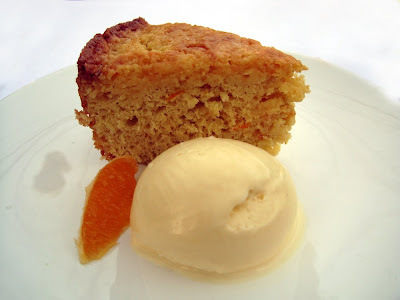 I paired it with a non-January Gourmet recipe for Fennel Ice Cream, which is maybe the best ice cream I've ever eaten. I really can't recommend it enough. Even though the ingredients are simple - normal frozen custard ingredients plus fennel seeds - the result is stunning. The ice cream is rich, smooth, and perfectly fennel-flavored without being overpowering. Definitely a keeper! 1. Preheat oven to 350°F. Lightly butter an 8-inch springform pan. 2. Beat together butter, sugar, and zest in a large bowl with an electric mixer until creamy, about 2 minutes. Add eggs 1 at a time, beating until just incorporated. Whisk in the sour cream and tangerine juice, and then carefully fold in the remaining ingredients until just combined. 3. Transfer batter to baking pan and bake in the middle of the oven until golden and a wooden pick inserted in center comes out clean, about 40 to 50 minutes. 4. 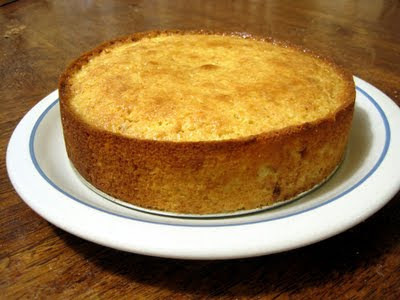 Meanwhile, make the glaze by whisking together the tangerine juice and confectioner's sugar. Poke the just-out-of-the-oven cake all over with a wooden skewer. Carefully pour the glaze evenly over the cake. Allow it to soak in for about 10 minutes before serving. 1. Bring cream and fennel seeds just to a simmer in a small heavy saucepan, then cover and let steep about 30 minutes. 2. Meanwhile, bring milk, 1/4 cup sugar, and a pinch of salt to a simmer in a heavy medium saucepan over medium heat, stirring. 3. Whisk together yolks and remaining 2 T sugar in a large bowl, and then add milk mixture in a slow stream, whisking constantly. Return mixture to medium saucepan and cook, stirring with a wooden spoon, until mixture coats back of spoon and registers 175°F on an instant-read thermometer (do not let boil). Immediately strain custard through a fine-mesh sieve into a metal bowl, then quick-chill by setting bowl in an ice bath and stirring occasionally until cool, about 15 minutes. 4. Strain fennel cream through fine-mesh sieve into custard, pressing on solids. Continue to chill in ice bath until custard is very cold, then freeze in ice cream maker. Transfer to an airtight container and put in freezer to harden, about 1 hour. This recipe is fairly simple but packs a big flavor punch. I adore braised greens, and they're perfectly tender and flavorful in this recipe. It's sort of a pain to wash and chop four bunches of kale, but it's definitely worth it in this case! The chorizo adds a salty, smoky flavor, and the lemon juice brightens everything up nicely. Overall, a very satisfying pasta dish that's great for dinner and keeps well for lunch the next day. I'm sending this off to Presto Pasta Nights. Thanks to hostess Ruth of Once Upon a Feast! Heat a non-stick Dutch oven over medium heat. Add the chorizo and saute for a couple of minutes. Add the shallots along with olive oil as needed. Cook until the shallots become translucent, stirring occasionally. Add the garlic and season with salt and pepper. Saute for about 5 minutes, until the onions are golden brown. Add the kale along with additional olive oil as needed. Toss until wilted for about 3 minutes. Cover the pot and reduce heat to medium-low. Add water gradually as needed if the kale becomes dry. Braise until the kale is tender, about 20 minutes. Meanwhile, cook the pasta in a pot of boiling salted water until just shy of al dente. Drain, reserving a cup or so of the cooking liquid. Add the drained pasta to the kale, along with the lemon juice and about 1/4 cup of the reserved pasta water. Toss to combine, and add more pasta water if dry. Serve with Parmesan cheese. 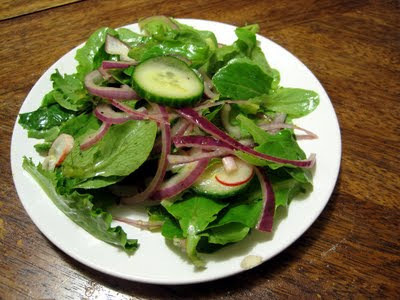 This salad is tasty and refreshing. It requires a little advanced planning since the cucumbers, onions, and radishes must marinate for about half an hour, but otherwise it's super easy. 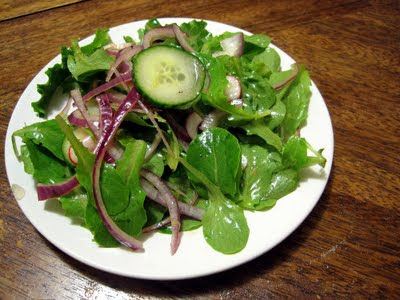 The crunchy vegetables are marinated until just slightly pickled, and then everything is tossed together with greens so that the marinade becomes the salad dressing. I love this treatment for cucumbers and onions, which neither of which I love just tossed raw into salads. Marinated, they're much tastier and have a better texture. We found the original recipe to be a bit heavy on the onion, so the amount is reduced below; if you're particularly fond of onion, feel free to use a whole small red onion. 1. Combine the lemon zest, lemon juice, vinegar, salt, and pepper in a bow and slowly whisk in the olive oil. Taste for seasoning and add more salt and pepper as needed. Add the cucumber, onion, and radishes and let marinate at room temperature for 20 minutes. 2. Add the lettuce and toss to combine. Serve immediately. These cookies from Lottie + Doof are absolutely incredible. They're super easy to whip up, but the flavors more than deliver. 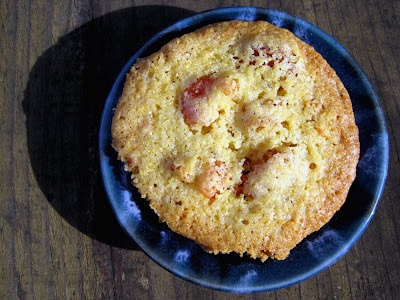 The cornmeal adds a sweet crunch, while the apricots are perfectly tart and chewy. The herbs aren't too overpowering, and definitely give these cookies an adult twist. The original recipe used fresh sage, which I didn't have on hand. I decided to substitute some dried herbs that I did have in the house, with excellent results. These were greatly enjoyed by both housemates and friends from church, and I'll definitely be making them again! Don't be alarmed if the cookies smell overwhelmingly of thyme when they come out of the oven -- the scent mellows as the cookies cool, and the flavor is just right and not too strong. In the bowl of a stand mixer fitted with the paddle attachment, beat the butter and sugar until pale and fluffy, about 2 minutes. Scrape down the sides of the bowl. With the mixer running, add the egg, mix to incorporate, and scrape once more. Sift the flour, baking soda, and salt into the mixer and add the cornmeal. Mix on low speed until just combined. Add the apricots, thyme, and rosemary and mix to combine. (Don’t worry if the dough is slightly sticky.) Shape it into a disk, wrap in plastic wrap and chill at least 30 minutes. Remove dough from the refrigerator and preheat oven to 350° F. Line a baking sheet with parchment paper or aluminium foil. Pinch off pieces of dough the size of large marbles and roll them into balls. Place the dough balls about 2 inches apart on the prepared baking sheet to allow the cookies to spread. Bake them as is, or press down lightly on each cookie with a flat-bottomed glass dipped in sanding sugar. Bake the cookies until light golden brown around the edges, about 10 minutes. Transfer to a wire rack to cool. I'm sending these cookies off to the holiday cookie exchange at A Fine House. Hi, all! This is Sara's friend Erin, serving as your guest blogger for today. I had the honor of winning a giveaway (http://cupcakemuffin.blogspot.com/2009/09/apricot-preserves-and-giveaway.html) on this blog a couple months back, and received a copy of the book Frugal Foodie as a result - hooray! I asked Sara if she wanted me to write an entry about my first attempt from the cookbook, and she said yes, so here I am. I recently got married and have been slowly working my way through a bunch of new cookbooks I received as gifts, and only just got around to trying Frugal Foodie. 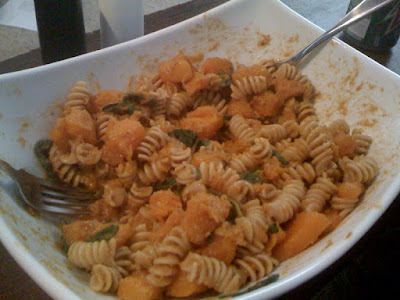 In a pathetic attempt to believe that it is still autumn here in Massachusetts despite the giant blizzard currently raging outside, I decided to give the recipe for Squash and Sage Sauce a go - butternut squash is one of my favorite fall foods, and I'm not quite ready to accept winter yet. 1. Melt 2 tablespoons butter over medium-low heat in a large stockpot. Add the squash cubes and sauté until tender, about 8-10 minutes. Remove the squash from the pot with a slotted spoon and set aside. 2. Melt the remaining 6 tablespoons butter in the pot. Add the sage leaves and cook until the edges start to curl, watching closely that the butter doesn't burn. Remove the sage leaves and set them on a paper towel to drain. 3. Add the broth and cinnamon to the butter and stir to combine. Add the pasta and toss to coat. Season with salt and pepper. Serve with the sage leaves and Parmesan. Even though I love butternut squash, I'd actually never tried to cook it myself before, so I decided to spend a few extra dollars and get the pre-peeled, pre-seeded, pre-chopped version from the grocery store. The recipe calls for the squash to be chopped into 1/2" cubes, but, being somewhat lazy and already having melted the butter in the pan before taking the squash out of the fridge to discover that the pre-cut version cubes are much bigger than this, I decided to just try a "rustic" variation on the recipe and leave the chunks large and irregular. Note to readers: do not attempt this. Although the end-result was delicious, it was nearly impossible to get the large chunks of squash to both cook through and sauté. I had figured that my large squash cubes would take somewhat longer than the 8-10 minutes allotted for cooking in the recipe, but it ended up taking half an hour to cook them until they were not rock hard. In the end, I resorted to adding a couple tablespoons of water to the pan and covering it to steam the squash, which was extremely effective, but I have a good feeling that the recipe would have been even better had I been able to get a nice caramelization on the squash instead of merely getting them soft. The recipe did not specify how much pasta to use for this quantity of sauce, so I simply used what I had on-hand - about half a box of whole-grain rotini. This seemed to work well, although I think the sauce could easily have supported a larger portion of pasta if you wanted to stretch the number of servings. If I were to make this recipe again (and I think I will), I would change the way that the sage is integrated. Although I loved the flavor, my husband and I agreed that the texture was somewhat overwhelming and distracted from the rest of the dish. I think that next time I will either leave the sage in the butter/broth/cinnamon mixture for several minutes to let it infuse its flavor before removing it completely, or dicing it up into smaller bits after cooking. 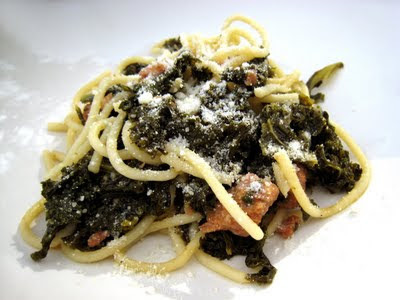 I may also experiment with folding spinach leaves into the pasta at the end - I did enjoy the color the sage leaves added to the dish, and I think spinach would add that element back into the dish if I were to remove the sage. Overall, both my husband and I were pleased with this dish. It was hearty, warm, and had just the fall flavors I was looking for. I suspect it held up well for left-overs: although there were about 2 servings that I put into the refrigerator, both had been eaten by my husband by the time I went looking for them for my lunch today! Many thanks to Sara and to Publishers Group West for this cookbook - I look forward to trying more recipes from it in the near future. I'm a huge fan of rolled sugar cookies, but don't often make them because they're much more of a pain than the average cookie. But - so worth the work! I definitely need to invest the effort more often. :) These rolled sugar cookie are based on my mom's recipe, but they're all butter and jazzed up with tangerine zest, freshly grated ginger, and a vanilla bean. 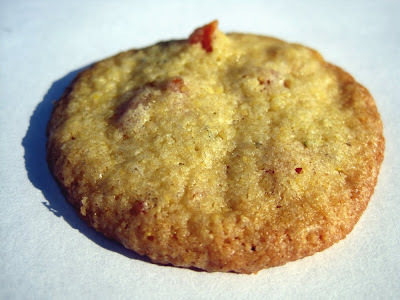 None of the flavors is too overpowering, resulting in a crisp, delicate, and fragrant cookie. Next time I would double the fresh ginger (to 1 tsp) as I felt that flavor didn't really come through well enough. 1. Beat together the butter, sugar, vanilla bean seeds, and tangerine zest until fluffy. Add the egg, tangerine juice, and ginger and beat well. Sift the flour, baking powder, and salt into the bowl and beat until well combined. Chill at least 3 hours. 2. Roll dough out very thin. Cut with cookie cutters. Place on parchment-lined cookie sheet and bake at 375 degrees for 7-8 minutes. Re-chill any scraps before rolling out again. Glaze with tangerine glaze, recipe below. Whisk together sifted powdered sugar, a bit of soft butter, tangerine juice, and food coloring (if desired). Start with just a bit of liquid and add more to get the desired consistency. I'm submitting these cookies to Serena's Cookie Exchange. Be sure to check out all the other recipes at her blog! 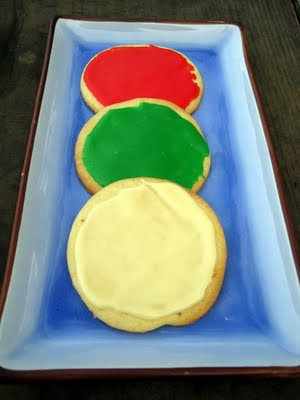 These cookies are also heading over to the 12 Days of Sharing Virtual Cookie Jar. Don't miss your chance to donate to a good cause and win lots of fabulous prizes! 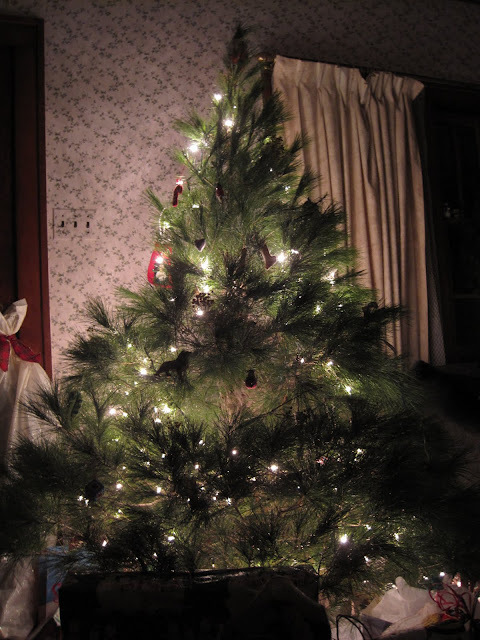 And be sure to check out all the holiday recipes at In Jennie's Kitchen. These pumpkin cupcakes with crumble topping were my mom's favorite of the three varieties we baked for her school, and I loved them as well! As you can see below, you can add more or less crumble depending on your taste. 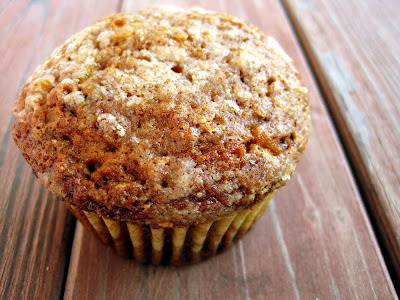 The crumble and walnuts add an excellent crunch to the muffins, while the pumpkin keeps everything moist and tasty. 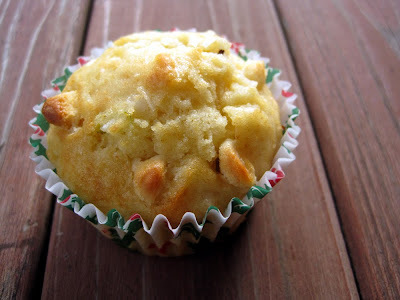 I love this type of muffin with an extra sweet, tasty crust on the top and a moist, less-sweet interior. The original recipe had almost twice as much sugar in the batter, but we tasted it and thought it was plenty sweet without the extra sugar. 1. Preheat the oven to 375 degrees. Grease muffin tins or line with wrappers. 2. Make the topping: Whisk together the flour, brown sugar, and cinnamon in a small bowl. Add the butter and cut in with a pastry blender, two knives, or your fingers until the topping is crumbly and well combined. Set aside. 3. Make the muffins: Whisk together the flour, baking soda, salt, and spices in a large bowl. Add walnuts and stir to combine. 4. In another bowl, whisk together the eggs, melted butter, orange zest, pumpkin, and sugar. Add to the flour mixture and fold in with a rubber spatula until the ingredients are just combined, being careful not to over mix. 5. Fill the muffin cups almost to the brim. Sprinkle the top of each muffin with about 2 tsp of topping. 6. Bake muffins until golden brown and a tester comes out clean, about 20-30 minutes. I'm sending this post off to BSI: Pumpkin! These muffins were the second of three varieties my mom and I baked for a staff breakfast at her school. 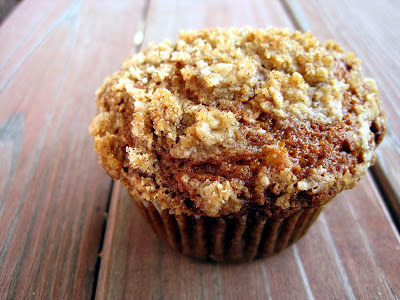 These are are much more the "cupcake disguised as breakfast" style of muffins, and they're extremely delicious. (You might be able to guess this was my favorite recipe of the three!) They're sweet, moist, and full of coconut and lime flavors. The white chocolate adds sweet bursts of richness, while the acid in the lime sets everything off nicely and keeps these from being too over-the-top. I recommend serving these muffins warm, either a few minutes out of the oven or after 10 seconds in the microwave. Preheat oven to 400 degrees. Line muffin tins with paper liners. Whisk together the flour, baking powder, salt and coconut in a large bowl. In another bowl, whisk together the eggs, milk, sugar, canola oil, lime zest and vanilla. Pour into the bowl with the flour mixture and fold together with a rubber spatula until just combined. Add the white chocolate chips and fold gently to incorporate. Fill the muffin tins, and then cook in the preheated oven for 15-20 minutes until a toothpick inserted in the center comes out clean. You may need to tent the tops with foil if they get brown too quickly. Cool for at least 10 minutes before serving. 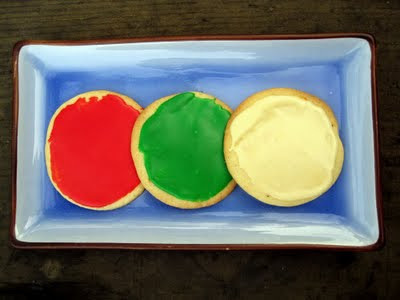 I'm submitting this recipe for the 12 Days of Sharing Virtual Cookie Swap! Click below to check it out and donate to a good cause. When I was visiting my parents over the Thanksgiving holiday, my mom and I baked tons of muffins for her school. 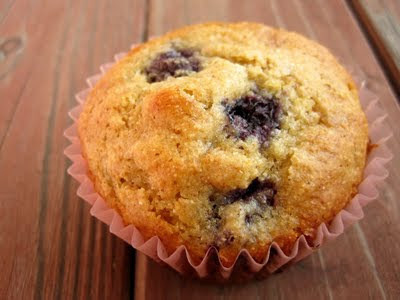 These blueberry corn muffins were our first effort, and they were really delicious! They're a little heartier than your average blueberry muffins thanks to the cornmeal, meaning your breakfast will actually fill you up for the day. They're moist thanks to honey and buttermilk, and not too sweet. You could substitute other berries in this recipe (the original recipe used raspberries), according to what you have available. 1. Preheat the oven to 400 degrees. Butter or line muffin tins. 2. Whisk together the flour, cornmeal, baking powder, baking soda, salt, and cinnamon in a large bowl. 3. Place the eggs, honey, brown sugar, white sugar, buttermilk, and melted butter in another bowl and whisk to combine. Add the egg mixture to the flour mixture and stir with a rubber spatula until just combined. Gently fold in the blueberries, being careful not to overwork the dough. 4. Fill the muffin tins with batter and bake until golden brown and a tester comes out clean, 20-25 minutes.